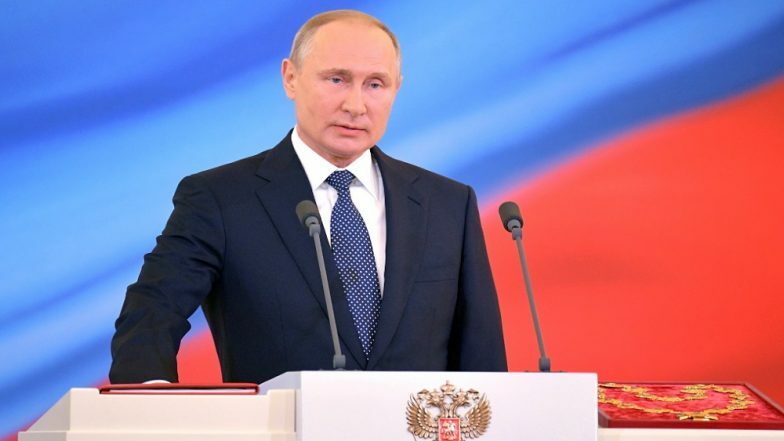 Moscow, March 19: Russian President Vladimir Putin has signed into law two set of bills aimed to ban and punish the spread of fake news that pose security risks and news that contain offensive information. The laws were published on Monday on Russia's official information portal, Xinhua news agency reported. One of the laws bans the dissemination of information "under the guise of credible reports," which harms people's life or health and disturbs public order or the operations of public facilities. Penalties for violating these laws vary from 30,000 to 400,000 rubles ($466-6,215) for individuals, from 60,000 to 900,000 rubles ($932-13,985) for officials and from 200,000 to 1.5 million rubles ($3,108-23,309) for legal entities. Under the laws, prosecutors will have the power to determine the danger criteria caused by the fake news. If prosecutors find unreliable and socially dangerous information online, they can request telecommunications watchdog Roskomnadzor to restrict access to the information sources. The other set stipulates penalties for spreading information offending human dignity and public morality, expressing disrespect for the society, the state, the state symbols, the Russian Constitution and the bodies exercising state power. People found guilty of those actions will face a penalty ranging between 30,000 and 300,000 rubles ($466-4,663) or administrative arrest of up to 15 days.